Happy Monday everyone!! I hope you all had a good Valentine’s Day weekend! Drew and I celebrated in Hawaii but decided to go out for another Valentine’s dinner on Saturday (we met the guy that my little sister, Megan has recently been dating, OMG!!) We took the red eye home so we all were exhausted but there was no way Emily and I would pass up an opportunity to be nosy older sisters and get the scoop! Haha Megan is going to kill me for telling you guys this. So far so good, we like him!! Anyway….I had lots of questions on my instagram about this dress I’m wearing. It’s from Luisa Via Roma (the amazing boutique in Florence). On top of free express shipping from Italy and free returns, they are having a HUGE sale right now and these hot pink Valentino’s are 30% off plus you get another 30% off at checkout!!!!!!!! Thought I would let all of you Valentino lovers know!! Beautiful summery dress! I can’t wait for some better weather here. Such a fun vacation look! Love everything about the dress, be it the sensual off-shoulder style, the pretty ruffles or classic stripes! Beautiful outfit! Perfect beach time outfit! I can’t wait for the days to get longer and warmer, I’m totally craving the Summer! Hihi, I already saw a pic on her instagram:o) Great choice!!! This outfit is adorable! Got to check out the Valentino now with the same. Tell you sister it’s a good thing y’all mess with her! Love the dress! Hope you had a wonderful time in Hawaii! Super cute flutter dress!! Hope you guys had a wonderful Anniversary! what a beautiful and light dress, love it! Such a cute cover up! Love the ruffles! Love this dress, very feminine. What a cute summery dress!! I love it. That dress is too cute. And I love your bag! Yellow bag is absolutely my favorite! I love the off-the-shoulder style! 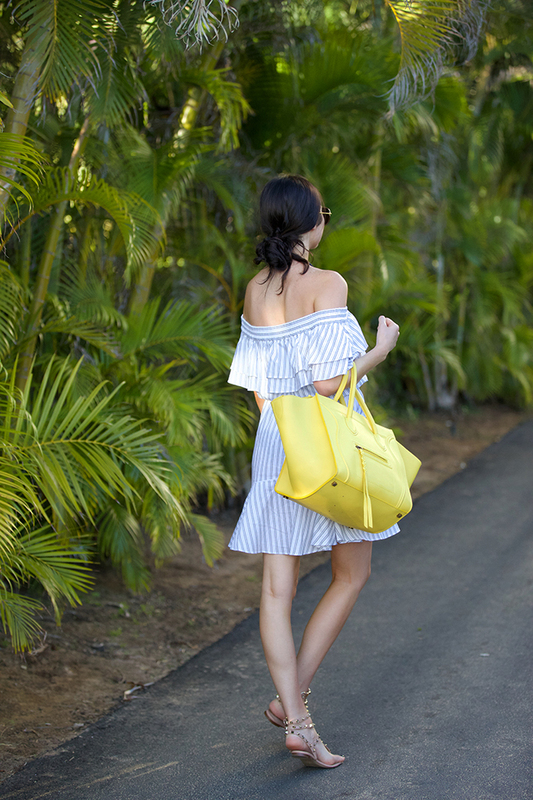 The yellow pop of color with the bag is also so cute! I love this cover up! Your swimsuits have been so gorgeous! This coverup is so cute! And I totally would’ve gone to dinner as well! It’s always fun meeting the boyfriend ha! ;) I’m glad you guys approved. I love the asymmetrical ruffles! It’s so fun and modern. I *love* off the shoulder dresses. It’s been my go to lately for most looks! love that dress! so so cute! Oh that dress is so pretty! I love the pop of yellow on the side. Such a very pretty dress, perfect for the beach! I adore this dress! I am glad the new guy is OK! Love your dress, and how exciting for your little sis! I love the dress and those Valentino’s are such a great deal, thanks for sharing! That’s so cute that you and Emily are protective of your younger sister, I’m sure she’s glad that you both like him! Thanks so much for sharing, beauty, and I hope you’re having a wonderful start to your week so far! Beautiful dress! I love the light blue striped with white! Such a cute vacation look, and I’ve been wanting those sandals since you first posted them! I am so in love with that CELINE! Your whole outfit is stunning! Love this! I would love to know if you use any tanning products;) thanks! Gorgeous look! I love the off-shoulder detail of the dress! I love this dress. It is gorgeous.